Do you have a great customer success story or case study to tell? Are you passionate about sharing your knowledge and helping people solve common challenges? How about a session focused on executive/C-Level and strategic leadership? Do you thrive on data and analytics? Do you love examining best practices and strategies, exploring product capabilities, design and providing technical guidance to fellow Higher Logic users? If the answer is yes, yes, yes, we can't wait to hear from you. 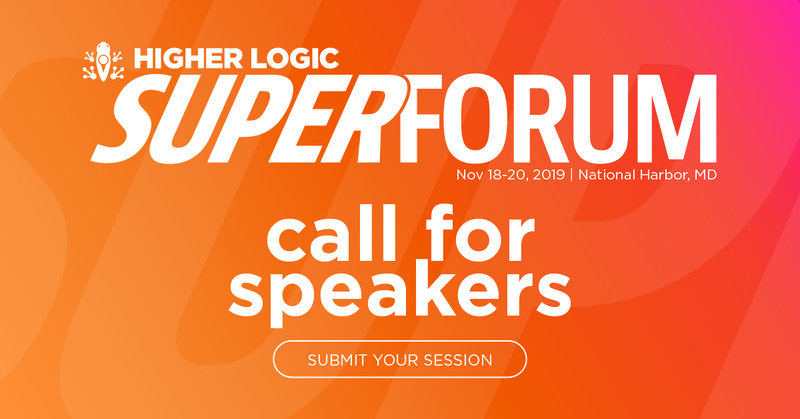 This year, we're looking for Super Forum sessions that will move the Higher Logic user community, forward, #AllTogether. Submit your session today. After we review every submission, we'll make our decisions. If you are selected to speak at Super Forum, you'll receive a discount of $200 off the early bird registration rate. All submissions must be in by May 1, 2019. Questions about submitting your Super Forum Session? Email the Higher Logic Education Team. Or call us at (202)-360-4402 | Ext. 6. We're here to help.